WILLEMSTAD - Willemstad will have a new seaside hotel by the year 2020: Majestic Apartments & Hotel. This was assured by the project developer Randy Neuman after the right of lease of the property was assigned to his company yesterday evening. The area is located right across the street from another property managed by the Neuman’s New Winds Reality, the parking garage and hotel in Punda. Neuman signed the act of notary Henri Burgers under the supervision of Prime Minister Eugene Rhuggenaath, Minister of Economic Development, Steven Martina, and other members of the Cabinet, and in front of family and a few hundred invitees. The tourist project comprises 104 apartments: 3 penthouses, 27 one-bedroom apartments and 74 two-bedroom and two-bathroom apartments. 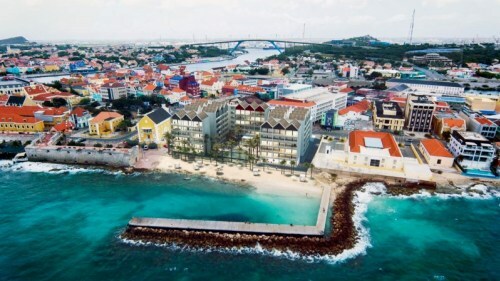 All units are for sale; the marketers of New Winds Realty are making global promotions for Curaçao, the historic city center and the World Heritage Site in a modern apartment on the Caribbean Sea. Neuman explains that Majestic is not an ordinary hotel. It is an apartment complex that works partly as a hotel, by renting apartments. The project developer is responsible for managing the project, but not the property, such as a regular hotel.